This wood floor in a Paducah home is sinking by 1/2". It's located over a crawl space. Sinking floors can lead to a variety of other issues, including jamming doors and drywall cracks. In addition, uneven floors over crawl spaces are often accompanied by serious mold problems. The floors in your home are significantly out of level. If you have a crawl space and the floors above are out of level, you may have a structural problem in your crawl space. Crawl space jacks can address the structural problems. If a concrete slab is uneven, it could be because of settlement or foundation heaving. Foundation settlement can be solved by installing foundation piers. Foundation heaving can be a very complicated problem, and a foundation contractor should inspect the problem in person. We fix the foundation problems that cause sinking floors! Call us for a free foundation repair quote today! 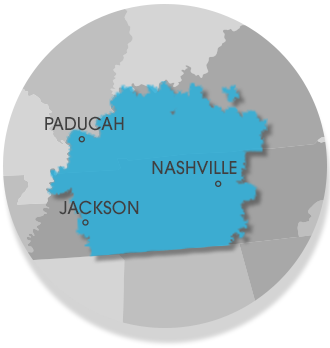 We serve Nashville, Clarksville, Jackson, Murfreesboro, Owensboro, Philpot, Bowling Green, Fayetteville, Marion, Utica, Franklin, Leitchfield, Paducah, Mcminnville, Hartford, Antioch, Shelbyville and many nearby areas in Tennessee and Kentucky. Uneven floors are rarely caused by problems with the floor system itself. Instead, it's often a settling or shifting foundation issue that has impacted the floor system. Floor beams and joists are made from wood that will usually bend or flex rather than crack or break. The same can't be said for masonry foundations. When soil issues cause a foundation to break, the floors above usually bend. Although the perimeter walls of a crawl space can settle or shift to cause floor problems above, it's more common for the center support system to settle or sag because it wasn't properly built in the first place. A center post-and-beam support system can also weaken and settle because moisture in a dirt-floored crawl space has caused wood supports to rot and collapse. As crawl space structures begin to sag, the floor above will sag in turn. Other symptoms of a sagging crawl space include interior wall cracks, jamming doors, and gaps between walls or doors and the floor underneath them. More about sinking, sagging crawl spaces. At Frontier Basement Systems, we can quickly and effectively repair a crawl space structural issue with our heavy duty crawl space jacks. Crawl space jacks are adjustable steel posts that will stabilize sagging crawl space structures. During installation, we prepare a base of compacted engineered fill at all jack placement points, located directly beneath the main support beam. We install a pre-cast concrete base on this fill, and then extend a crawl space jack between the base and the beam. Once each jack's threaded rod is adjusted beneath the post, the weight bearing on the beam is transferred to the soil below. Additionally, this system allows the contractor to push a sagging floor back toward its original level position. Our warrantied crawl space jacks can effectively stabilize your crawl space -- usually in a day. More about crawl space jacks. Since masonry is more likely to break than bend, concrete floors that are uneven are generally cracked and/or broken as well. If your foundation is settling, it may be lifting the concrete floor as the rest of the foundation experiences movement. There are also times where the slab floor can lift or sink independently of the walls. Concrete slab floors crack and settle when the soils underneath them shrink, settle or wash away. Likewise, a concrete slab will lift, or "heave", when the soils underneath expand. A concrete slab can move independently of adjacent foundation walls, or along with them. Since settlement isn't uniform, one section of a slab may be elevated as another section sinks down. More about sinking slab floors. Slab floors that are sinking independently of the walls can be repaired with a slab pier system, shown on the right. These piers are placed in cored holes in the floor, extending down to competent soils to hold your floor in place. They can even be used to lift a slab back to its original, level position. If the floor is cracked and uneven because of foundation settlement, then your contractor will recommend either foundation push piers or helical piers to stabilize the entire foundation. Foundation piers can also be used to lift the foundation to its original position in some cases. Foundation heave is a complicated and multifaceted problem that requires a professional inspection. To get your foundation fixed permanently, you will need to know exactly what is going on with your home -- and which solutions will best address the problem. It costs nothing to have a professional help you find out! Our team of professional foundation contractors can help. During our foundation repair quote, we'll personally inspect your foundation issue, explaining what's happening with your home and making suggestions for repair. Each of our visits comes at no obligation, and it includes a written foundation repair estimate. To schedule your free quote, call or e-mail us today! We proudly serve Jackson, Nashville, Clarksville, surrounding areas such as Owensboro, Murfreesboro, Bowling Green, Philpot, Utica, Fayetteville, Marion, and nearby.